Becky sent me this colorful envelope. She is one of my oldest pen pals; we have been exchanging mail for 3 years. It’s been awhile since we exchanged mail! With all good mail pals, there are some breaks here and there when life gets crazy or inspiration is low. 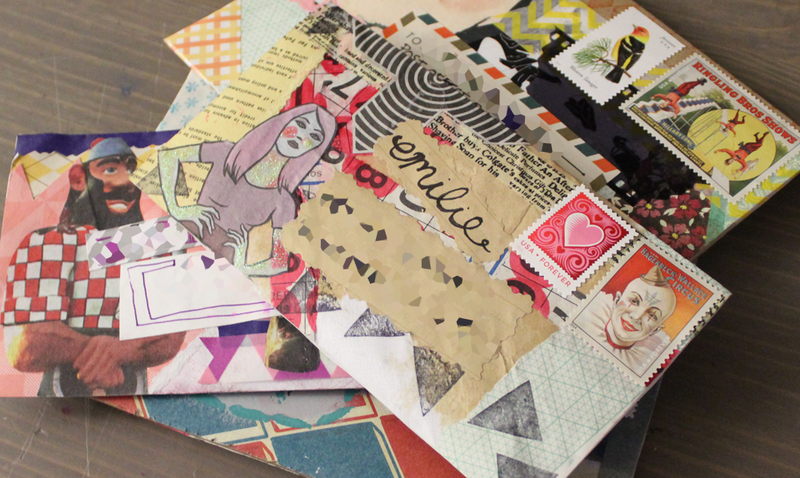 Mail art doesn’t have to be anything more than a pretty envelope. Becky has sent me her fair share of ephemera (like a handful of security envelopes with a purple pattern that I still use in collages!). She sent me this letter in an awesome envelope just to let me know that she was thinking of me. I love that this envelope matches the vibe of the Janis Joplin stamp. A psychedelic, colorful theme! I don’t know about Becky but I always try to match my postage stamps to a finished collage. 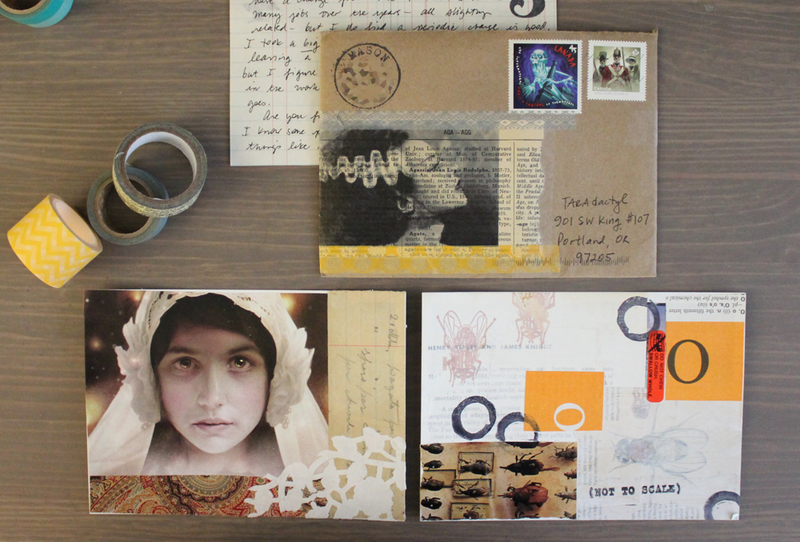 Becky also has a blog about mail art and other things. She posts a lot of great how-tos! Let’s talk about stationery! I’ve been on the hunt for the best paper to print my stationery on. 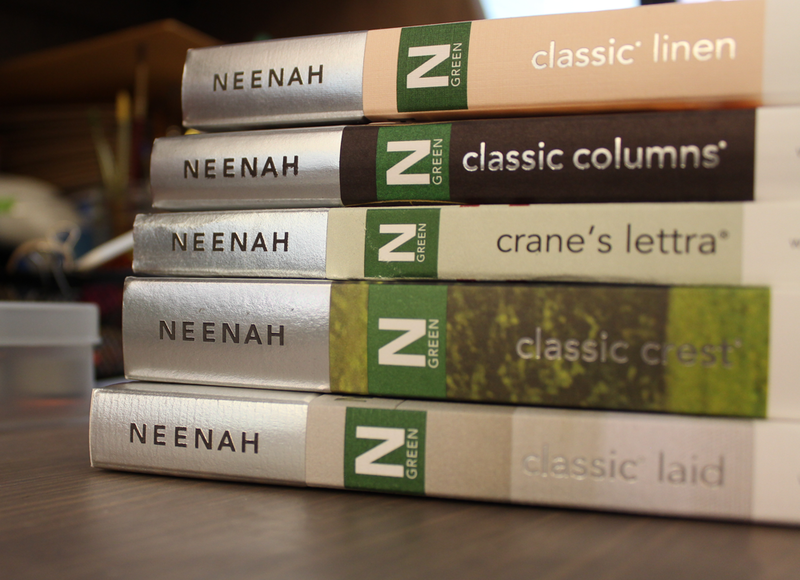 I recently ordered some paper samples from a company called Neenah Paper. 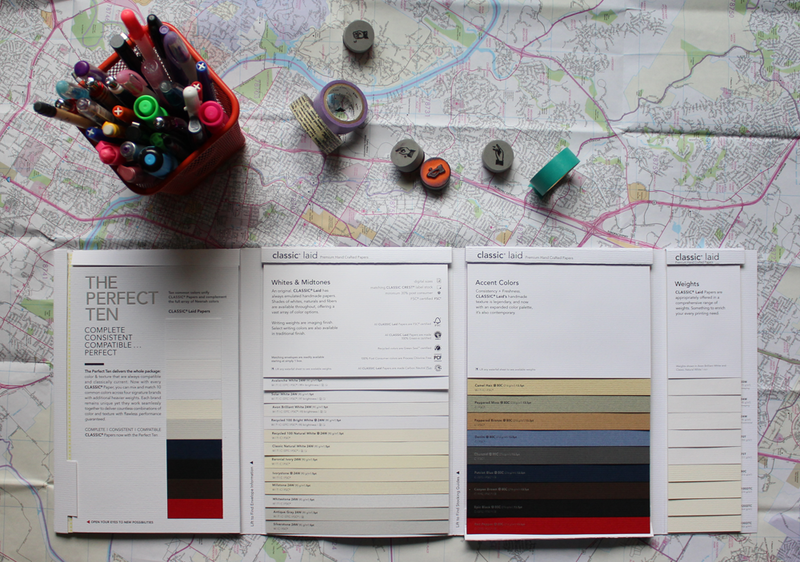 I’ve been trying to find paper samples for ages and somehow came across their website. I saw that you could order samples of the paper they carry, and went a bit overboard. The catalog itself is completely free, you just have to pay for shipping. I was so anxious to receive the package full of samples. I love stationery; love it. I love finding the perfect paper to write on even more. I felt like it took forever for the samples to arrive but it really only took a few days. 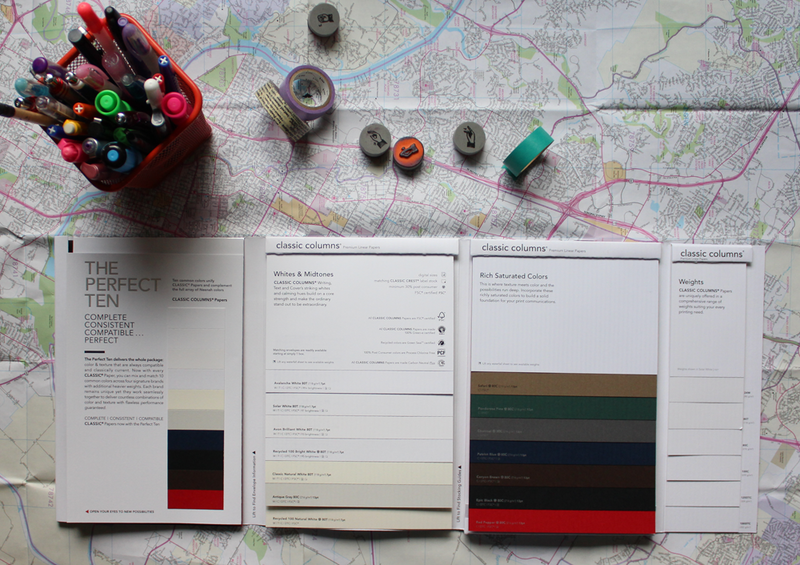 It was totally worth the wait though, the sample catalogs are gorgeous. They have a selection of every color that is offered for the specific paper type, the different weights they come in, and they just look awesome. Choosing the weight of paper is so important! I decided to write on the weight I thought would be best, with four different pens: Pentax EnerGel, Pilot Precise V7, Sharpie, and a fountain pen. I wanted to see how each pen felt writing on the paper, how much bleed there would be, and smudge-factor. 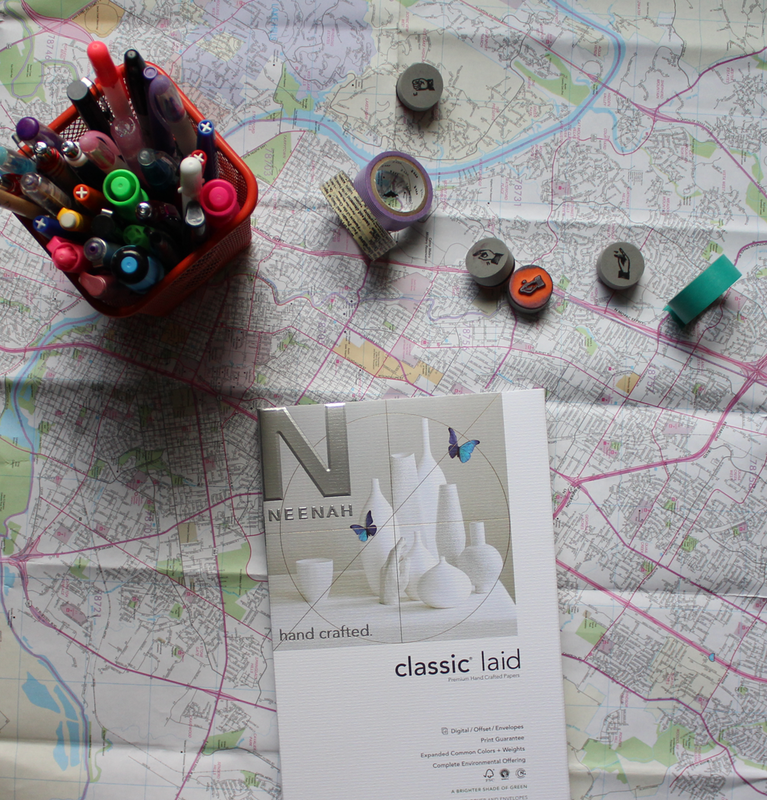 I’ve read a few positive things on different blogs about laid paper but it turned out to be really disappointing! I was expecting to really like this paper, especially for fountain pens. The smudge-factor was pretty high for all of the pens, and the texture of the paper makes it difficult and uncomfortable to write on. The paper has very small lines that run horizontally. I love the feel of it but the pens don’t! The bleed-through is pretty low, which is probably the only redeeming factor of this paper! 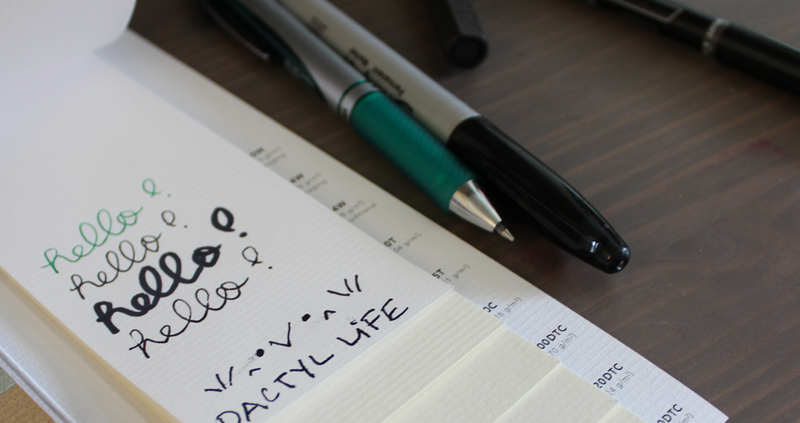 ► Pens used: Pentax EnerGel, Pilot Precise V7, Sharpie, and fountain pen. ► Writability: Poor. Too much texture! 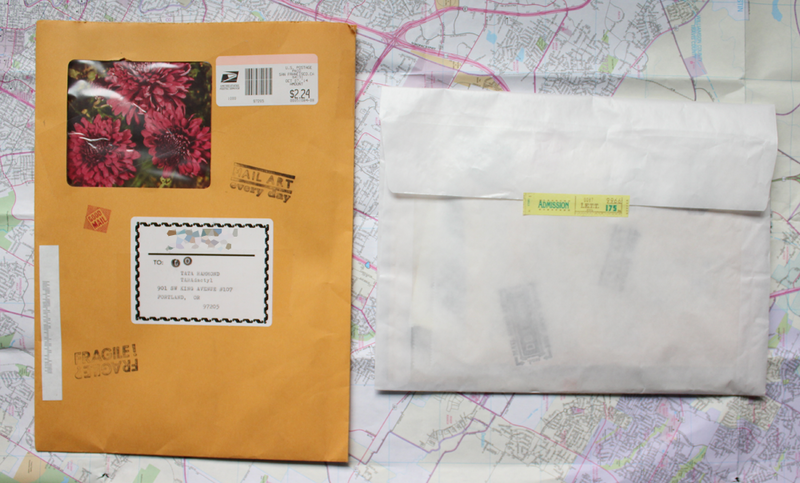 I won a giveaway on Pamela’s blog awhile ago — check out the awesome things she sent me! 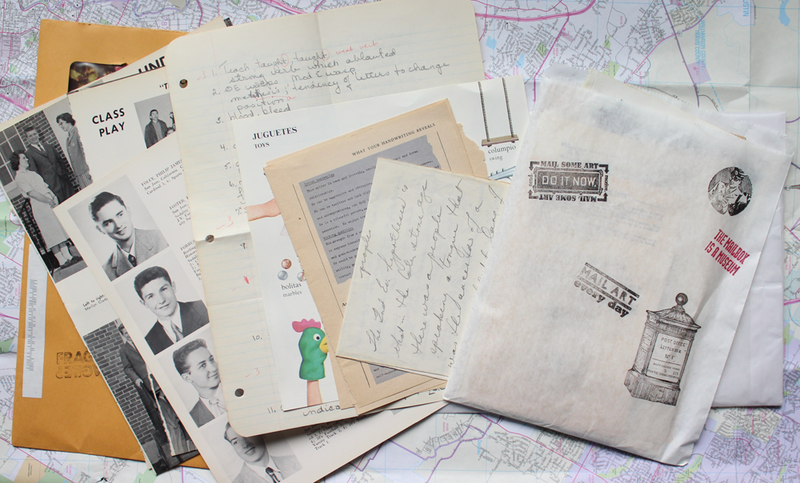 She sent me loads of ephemera. 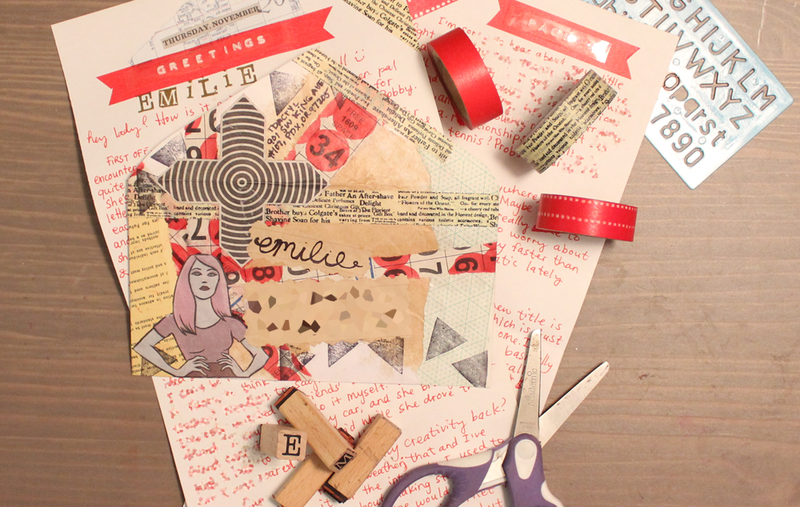 If you check out her blog, you can drool over the variety of paper goods she picks up. San Francisco seems to be the place to be for finding the best collage materials. I’m super excited to start using these bits in collages! I love the yearbook pages; they are always my favorite. Look at those rubber stamps. I need them all in my collection. 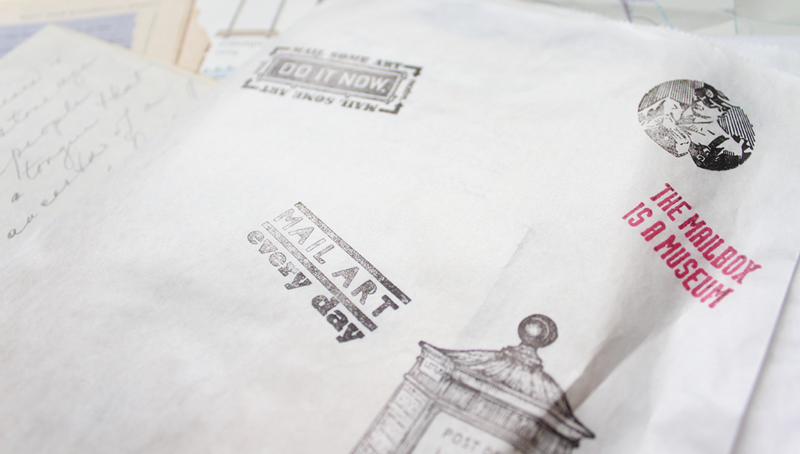 Whenever I am looking for rubber stamps, I can never find any cool postal/mail art related ones. I guess I should do my rubber stamp shopping online. Any suggestions? This lovely envelope was sent to me my Adrienne in Canada. She found me through my blog and decided to send me a postcard. I upped the ante and sent a letter in return. My favorite thing about this envelope is the overlay of text on the image of Frankenstein bride. I wish I knew how she did it! It’s awesome. She also matched the spooky theme of the envelope with some Halloween stamps. Adrienne also has a blog dedicated to her collage adventures, Tough City Writer. You should definitely check it out! She does some pretty amazing collages, as you can see by the paper she collaged to write the letter. 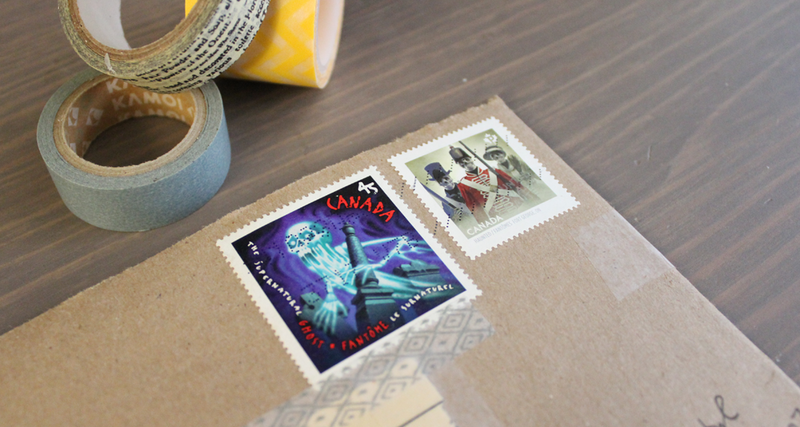 She kept the spooky theme throughout the letter with the skeleton stamp and washi tape. 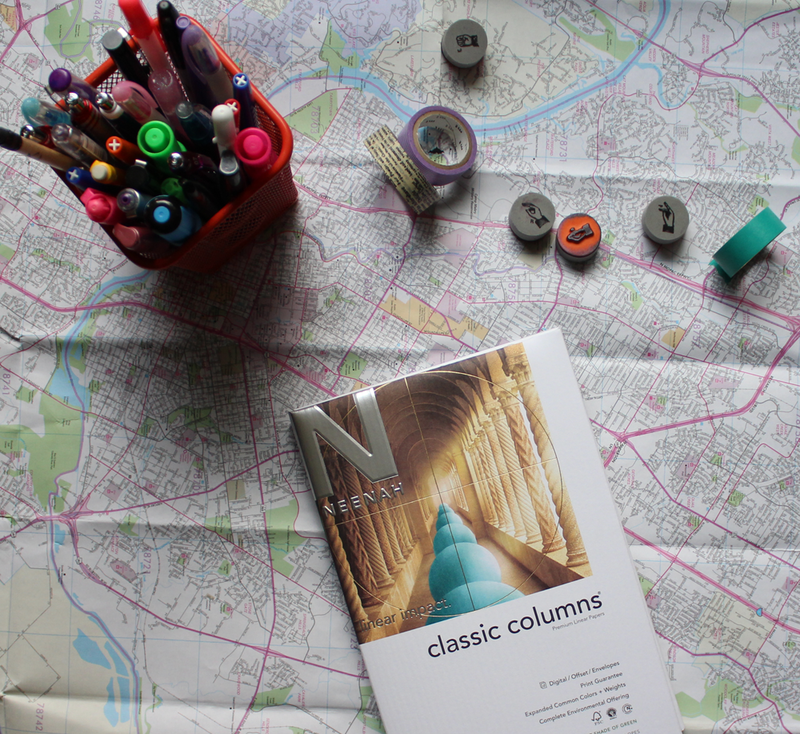 Columns is such a lovely paper. It might be my favorite but it’s so hard to choose. There are, quite literally, little columns that run vertically on the paper. It adds such a beautiful texture to it. 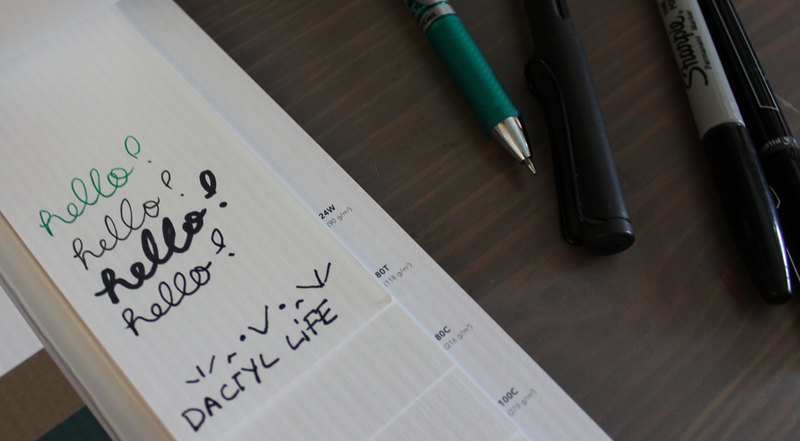 I was concerned that it would feel weird to write on, especially with a fountain pen. I was wrong! It was wonderful to write on with all the pens. The smudge-factor was low, the only pen that smudged was the fountain pen. I take that with a grain of salt, since I intentionally swiped my finger on the ink immediately after I wrote it. There is no smudging if you wait a few seconds before touching the ink! There is, however, a bit of bleed-through. You can’t win them all! ► Bleed-through: Moderate, with Sharpie being the worst offender. ► Writability: Excellent, smooth with the right amount of texture. I often lose sight of who I am and put my passions on the back-burner. I don’t know what causes me to do it. It’s just so easy to not have to worry about anything. It is hard to keep up with everything I love. My passions take a lot of work and time, but that doesn’t mean I should constantly ignore them. Are they passions if you do? Speaking from personal experience, I think they are. I’ve gone through the majority of my early twenties with significant credit card debt. That has always been my main reason for not pursuing the things I love; these things cost money. When I younger, living at home and working full time, I could afford to spend paychecks on new albums, postage, things I like to collect, zines and chemicals to develop film and photos. 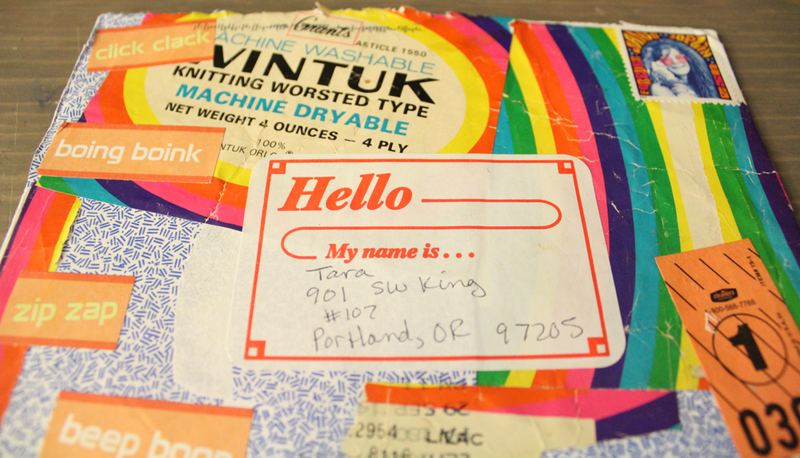 I had the space to have my own (temporary) darkroom and all the room in the world for mail art supplies. Then I moved out and everything changed! So, how do you stay inspired and keep doing the things you love? ► If you can’t afford to do something right away, save up for it! Admittedly, I’m very awful at doing this but you should definitely save up for the things that make you happy in the long run, rather than those things that give you instant gratification. ► Find other people who are passionate about the same things you are. The internet is the easy way to do this! 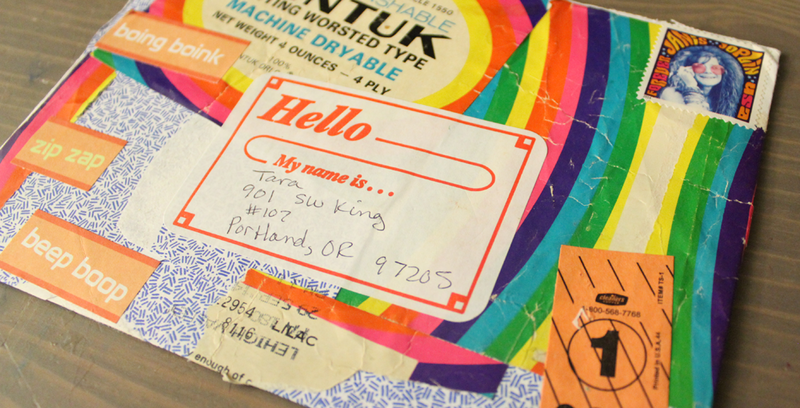 I love following blogs about mail art because it gives me a look into the processes of other people. It inspires me, even if I’m not directly doing it. ► Don’t procrastinate! Set aside time to do these things. I used to study programming and German in the beginning of this year because I had a schedule to do each daily, and made sure I set a timer to remind me. ► Recognize when you need a break. When I find myself putting things off for another day, I know that is when I need a break. Schedules are easily tossed aside, especially when life throws curve balls at you (like getting sick for a month!). Just make sure to come back to your schedule! ► Do something inspiring every day. I participated in the Month of Letters challenge and wrote 1 letter every day for the entire month. It was definitely a challenge but it was so inspiring. 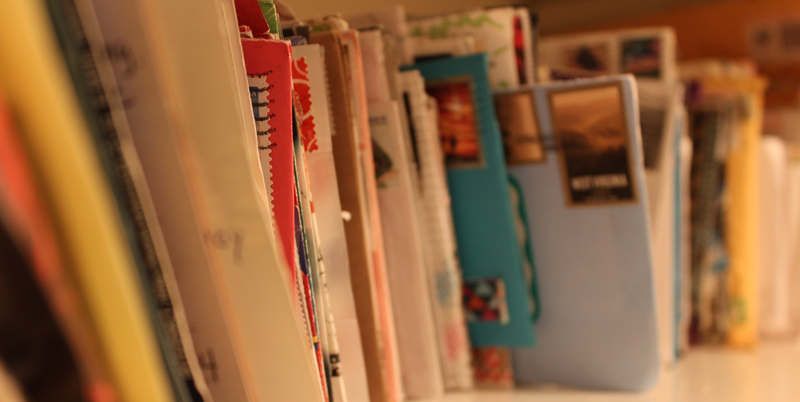 I love writing letters so why don’t I write them every day? ► Make it easy to do the things that inspire you. I’ve always loved photography but I don’t often take pictures. Whenever I’m out and about with my analog camera, I can’t stop taking pictures. It just feels natural! ► Do it. The strongest advice I have for being, or getting, inspired is to do whatever it is that you love. I find that when I start collaging an envelope, I don’t want to stop. It’s just a matter of just going for it. Once you start, you will not stop!